Little Sis loves playing with pipe cleaners and beads; just last week Big Brother and Little Sis kept themselves occupied by stringing beaded garland.... all on their own initiative. That kept them busy over the course of several days. I decided to bring out the pipe cleaners and beads again for Little Sis; this time we made Pipe Cleaner Trees and added beads as ornaments! 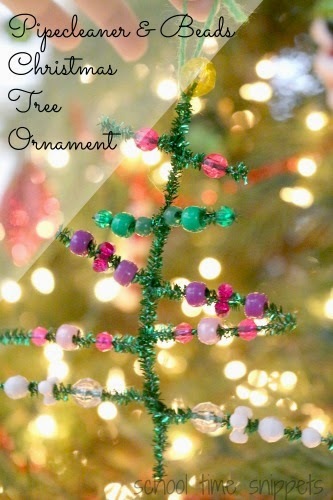 Thought I'd do a little mini series on the blog and today is Day 4 of 5 Simple Christmas Ornaments for Kids! Along with doing the basics, reading and crafting Christmas Around the World, I have been setting up simple invitations to create ornaments for my kiddos. They love crafting, so we have been busy! Today's ornament is very simple to make, although it may be a bit tricky for little hands to put together so assist as needed. 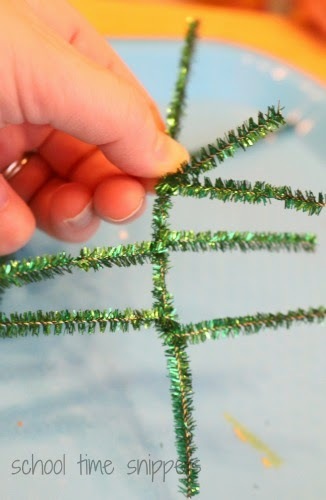 First I took two pipe cleaners and cut them various lengths, with the longest one being the Christmas tree "trunk." 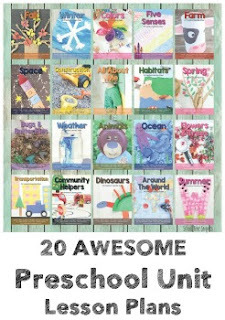 To add in some sneaky learning, have your little one sort the pipe cleaners shortest to longest! Starting with the longest lay it horizontally under the tree "trunk" and bend the "branch" over. Does that make sense? When your little one is all done decorating his/her tree, add some string and it is ready to be hung up on the tree. Hope you enjoyed this festive mini series on the blog! 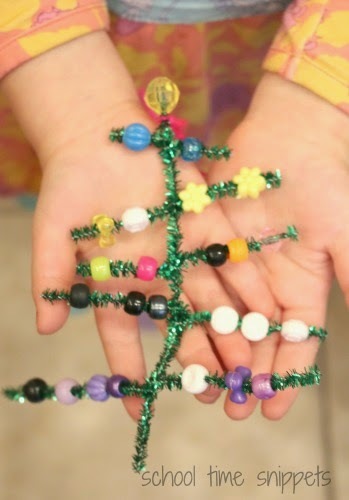 If you are just joining us, take some time to see the other Simple Ornaments Kids Can Make!